One afternoon, I heard a man’s voice — “Hello, ma’am” — when I finished crossing at the crosswalk in Little Tokyo. I turned around and saw a police officer dismounting from his motorcycle. I thought he was just being friendly, so I said hello back to him and assumed I’d just be on my way. As soon as I took a step forward, his tone of voice changed. “Excuse me, ma’am? I need to give you a citation for jaywalking,” the officer said. “Jaywalking?” I was surprised to hear that because as I mentioned, I walked at the crosswalk, the signal indicated 17 seconds left, and of course, I finished crossing before the signal turned red. I was waiting for him to smile because I thought he was joking. But unfortunately, I was so wrong. Instead, the officer showed no expression and started writing a citation. According to the officer, stepping off the curb is illegal once the countdown clock starts ticking and a blinking hand appears. 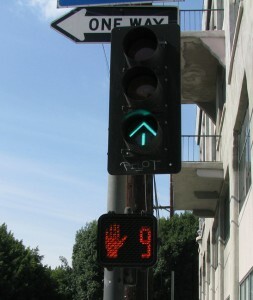 Pedestrians are allowed to enter the crosswalk only when the white “walking man” icon is lit. 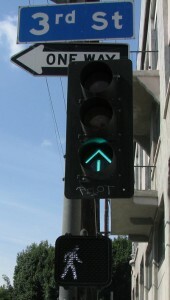 If pedestrians step off the curb while the walking man is visible, but the signal changes to a flashing hand before finishing crossing, they are safe as long as they can make it to the opposite sidewalk before the signal turns red. The countdown clocks are for those who are already in the crosswalk. I never knew about this rule. My understanding of jaywalking was that it meant crossing against a red light or outside of a crosswalk, which I’ve never done because I knew those practices were illegal. I told the officer that I thought the countdown was for all pedestrians to know how much time we had left to finish crossing. And at many crosswalks in Little Tokyo, the white walking man appears for only a few seconds. He admitted that many people misunderstood what the countdown clocks were for. (Given that, perhaps the LAPD could have focused more on educating the community before issuing tickets.) But it was too late for me. The citation was already in my hand. I was stunned to find out about this unknown traffic rule, but what shocked me the most was how surprisingly expensive this jaywalking ticket was. I assumed that it might be $75 or so, but again, I was so wrong. It was $197. I paid online so an e-Public Access service fee of ten dollars was added. It totaled $207. It was painfully expensive, and I was very upset. After receiving the ticket, I learned that Los Angeles Downtown News had published several articles in the last six months about this unfamiliar traffic rule as well as the LAPD Central Division’s recent aggressive enforcement and residents and workers’ uproar over high fines of up to $250. As reported by DT News, the LAPD and the Historic Downtown Los Angeles Business Improvement District hosted a community meeting in January 2014 to discuss this matter. About 50 people gathered to voice their opinions. In response to participants’ claims that people are unaware that the practice is illegal, the LAPD is considering implementing a warning system rather than issuing fines immediately. In regard to the price of the ticket, the LAPD said it was the city’s decision. Although they acknowledged the need for more education about pedestrian safety, they planned to continue enforcing the law in the meantime, according to DT News. Flashing hand and countdown mean it’s not okay to cross. Because I was so surprised to find out about this violation, I’ve asked the Rafu staff members, friends, and people at various assignment sites if they knew about this. Only six of the 40 people I asked knew. Being a pedestrian as well as a driver, I understand the danger on both sides, and I support the LAPD’s efforts to increase public safety. I’m not complaining about my ticket. Rules are rules. I get that. But I believe that there are better ways to enhance public safety. Instead of giving a “surprise” citation to pedestrians who have never heard of this law, the LAPD should issue verbal or written warnings until the community becomes well aware of this unfamiliar rule. As for fines, I understand it’s up to the city, but the first offense should be fined a smaller amount, with gradual increases for second and third offenses, just like citations for using a phone while driving. In the meantime, the LAPD should make more efforts to educate the public about this rule. For instance, between the January community meeting and when I was cited in April, I didn’t hear any information about this widely misunderstood rule from the LAPD. On Thursday, April 24, the Central Division posted a video explaining about jaywalking citations on their Facebook page. The video is an important resource for the community to understand this violation, so it should be circulated widely —not just on Facebook. Since the day I received the ticket, I keep telling people about this little-known pedestrian violation. It was an expensive lesson to learn, but now I know and you know. Stay on the curb as soon as the countdown clock starts. Ryoko Nakamura is a reporter for the Japanese section of The Rafu Shimpo and can be contacted at [email protected] Ochazuke is a staff-written column. Opinions expressed are not necessarily those of The Rafu Shimpo. I couldn’t find a California code violation for this violation. What was the code number written on your ticket? Or is this a Los Angeles city code only? Hello Harvey, Thank you for your comment. The violation code written on my ticket is 21456B. (https://www.dmv.ca.gov/pubs/vctop/d11/vc21456.htm). Also, the LTBA is currently working with the LAPD to hold a town-hall meeting in Little Tokyo. As soon as we find out the date and location, we’ll post it on our website, so please come to the meeting if you have questions or concerns regarding traffic rules and public safety. It’ll be a great opportunity to learn and discuss those issues with the LAPD. I also understand that you or others feel you should be informed/educated first or warned before a citation is issued. My question would be, how would the officer know if this was your first time at the violation or are just making up an excuse because you got caught? Don’t you think an officer hears all kinds of excuses each time they stop a violator, whether it be a pedestrian or driver? You’d be surprised how many people, nowadays, walk across roadways, sidewalks, intersections, without once looking up. It’s gotten worse, as many keep their eyes glued to their smartphones, not knowing what is happening around them, many to their peril. On another note, as far as the officer stating you were “jaywalking.” That is the incorrect term. 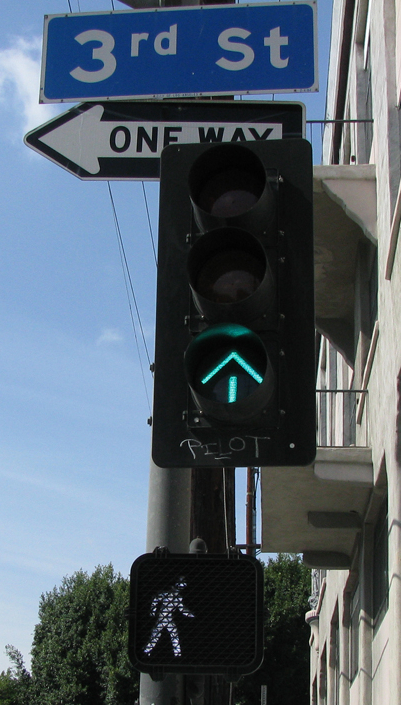 “Jaywalking” is when one crosses the road between two controlled intersections. A different violation altogether. 21955. Thank you very much for your comment. Since publishing this column, we’ve received a lot of emails from people saying they didn’t know about this rule, so the Rafu Shimpo and several Japanese community organizations are co-sponsoring a town hall meeting on Tuesday, July 29 at St. Francis Xavier Japanese Catholic Center from 6pm to 8pm. LAPD Deputy Chief Terry Hara, Little Tokyo/Arts District Senior Lead Officer Chris Jarvis, and former L.A. Department of Transportation official James Okazaki will be there to educate us on public safety. Thanks for the article Ryoko. I got the exact same ticket in Westwood 2 years ago. I stepped down the curb (in front of a motorcycle officer) when the pedestrian light was blinking and got to the other side with 14 seconds left. Since I walk faster that other people I made it to the other side while some pedestrians were still in the middle of the street. The cop pulled me over and slapped me with a $197 ticket. I thought he was joking but he was pretty serious. I went to the court and explained that the public is not aware of this law and the judge just shrugged her shoulders. I wrote my councilman Bill Rosendahl who promised to bring it up in their next meeting but nothing happened. Then I spoke to Judd Mcilvain, the consumer advocate on the radio who said that this was a “trash ticket” and that a warning would have served the purpose, Your article is beautifully written. My blood is boiling again (even after 2 years)! That was an interesting interaction with an LAPD officer. I have written to the City Mayor’s office to complain about the lack of enforcement for drivers running red lights in the downtown/Little Tokyo area. I have observed numerous occasions where vehicles run red lights, do not wait for pedestrians to complete their walk within the crossing area; and numerous other variations of “running red lights”, however, even when an LAPD officer is in the vicinity, nothing is done. I have informed the Mayor’s office that it won’t be long before someone is seriously hurt or killed, yet there is no enforcement. Guess the price of a life isn’t as significant as a pedestrian/jaywalking violation. Or maybe the LAPD and the Mayor’s office just don’t care about this part of town!